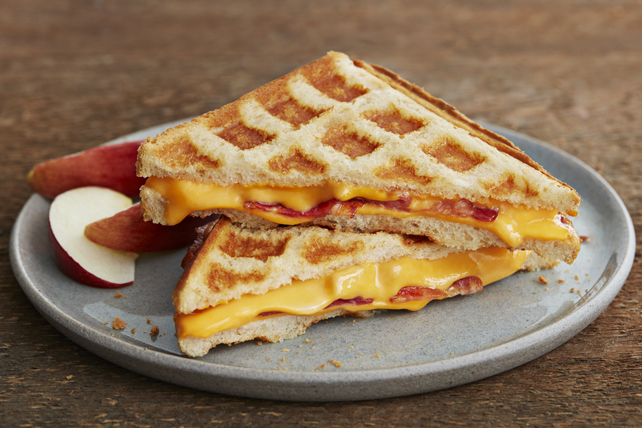 Give your grilled cheese sandwich a twist by using a waffle iron to upgrade this classic! Top 1 bread slice with 1 Kraft Singles and bacon; cover with remaining Singles and bread slice. Cook in hot waffle iron 3 to 4 min. or until Singles are melted and sandwich is golden brown. Heat waffle iron. Add bacon; close lid. Cook 2-1/2 min. or until crisp. Remove from waffle iron; drain on paper towels, then use to prepare sandwich as directed. Add 2 thin tomato slices and lettuce leaf to sandwich filling before cooking as directed.